PX CONSIDERED- PLEASE WHATSAPP OR TXT PHOTOS AND DEAL PROPOSAL TO NUMBER BELOW. Please call : 07718737264 with any questions, I have many more photos that can be sent via WhatsApp. 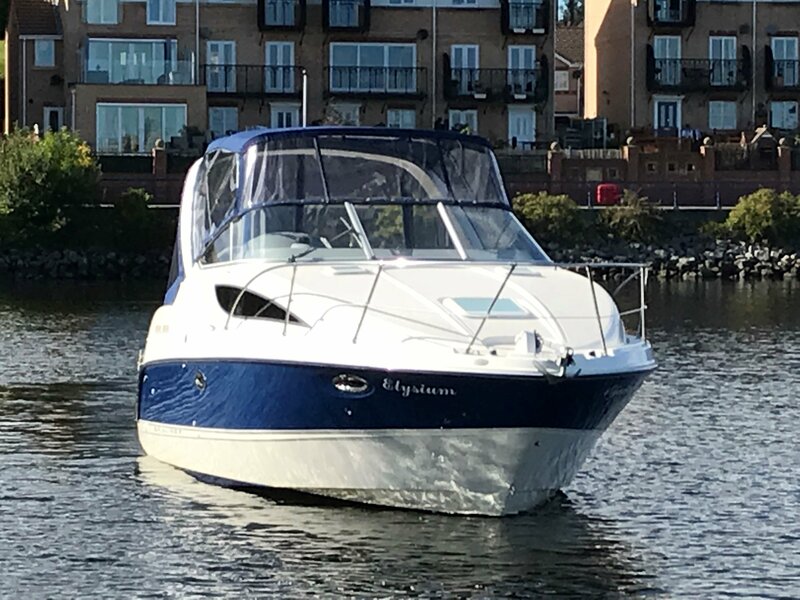 *** ELYSIUM *** A Video of Elysium in motion can be viewed by copy & pasting link below into YouTube: https://youtu.be/A4aQ6Ukkntk BAYLINER 285 Ciera 2004 Much loved, well-designed, spacious and popular American Sports-Cruiser, perfect for weekend adventures in comfort and style. Big, strong and safe enough to explore our wonderful estuaries, coastlines, and continental havens beyond. Brand-new (£2k) canopy provides excellent, all-round visibility, and shelter in windy conditions. With future sunny summers predicted, it can be zipped down to the bimini roof, or completely removed. As a marine engineer and keen boater, I have carefully maintained her fully functioning kit/gear and systems. Hopefully, I can answer any technical queries. LOA: 28’ 7”. 8.74M Beam: 9’ 11” 2.77M Displacement ~3250kg Large V-berth; Aft-cabin double berth; Galley table folds down into 3rd berth. Ample storage compartments. Microwave, Twin Hob--never used; needs only gas bottle & regulator. Fridge/Freezer 12/230v Shore-power 230v and Distribution/Breaker-panel. 4-way Battery Isolator to twin banks. Head: Jabsco electric flush, grey holding-tank, macerator, overboard pump. Shower (2nd showerhead in Swim-platform). Hot-water Calorifier. Mercruiser 300hp 350 MAG multi-point injection with only 180 hrs--diagnostic plug-in will confirm. Smooth and quiet. Fuel Filter (Racor water-separating) with brass water drain-off tap. Sea-water cooling Strainer and Power-trim pump on upgraded s-steel brackets. Bravo-3 Stern-drive: recently serviced with new bellows, water-tube, oil etc. 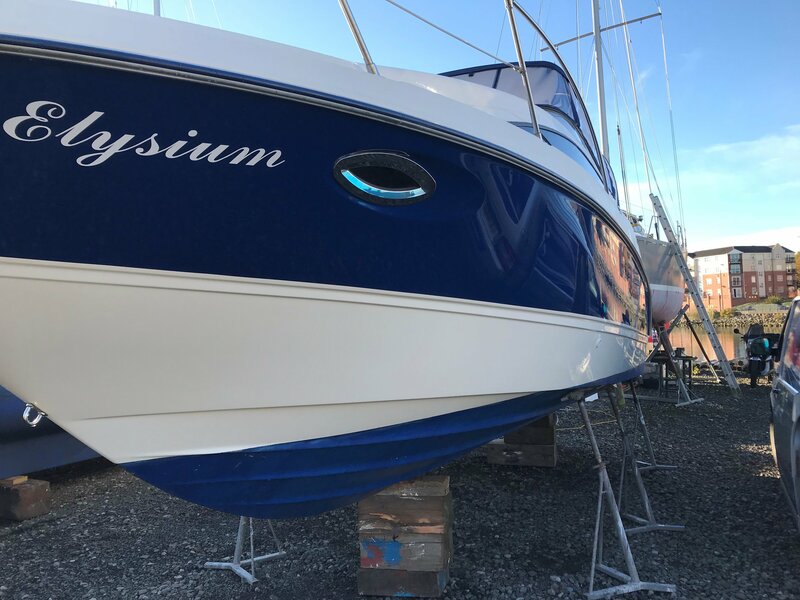 Blasted, etch-primed, epoxied and anti-fouled. S-steel Duo props. Hydraulic Trim-tabs, with extra anodes. Windlass-Electric, Anchor, Chain and new Rope. Fish-finder/GPS Chart-plotter (Raymarine-Dragonfly), Horizon VHF, Air-horn. New FUSION-Bluetooth Stereo: with phone link App, 10” Sub & 450W Amp. Flat screen TV, Hull cleaned, polished, waxed and anti-fouled. 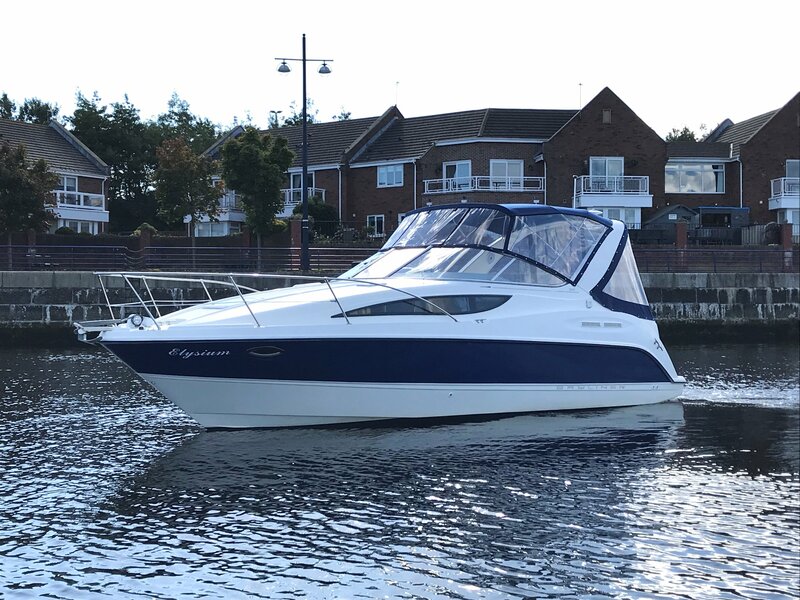 Currently on hard at Royal Quays Marina, North Shields, following many enjoyable summer cruises. Receipts inc original Receipt-of-Sale. Please call : 07718737264 with any questions, I have many more photos that can be send via WhatsApp. ?